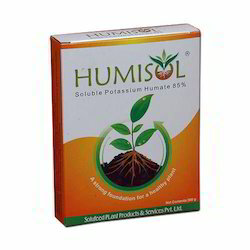 Manufactured as per the predefined standard compositions, this PotassiumHumate has been in wide demand for the major features of it. This product is availed to the customers at affordable price range. It consists of 80 % humic acid and 12 % potassium. Widely appreciated for 100% organic this has a non-toxic and environment friendly effect. An important part of fertilizer program it efficiently act as an effective fertilizer magnifier. The powdered form is widely used by farmers and increases the soil productivity. Looking for Potassium Humate ?